(CBS/WFOR/AP) DAYTONA BEACH, Fla. - Times are tough, but that is no reason to start selling children! 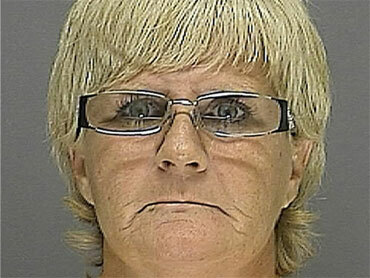 A Florida woman has been sentenced to five years in prison for a scheme to sell her infant grandson. Patty Bigbee, 47, was sentenced Thursday after pleading no contest in June to selling a child and communications fraud. Bigbee and her boyfriend, 42-year-old Lawrence Works, were arrested in November 2010 after accepting $30,000 cashier's check for the then-2-month-old Aidan Fleming at a Daytona Beach parking lot. The supposed buyer was actually a daughter Bigbee had given up for adoption years earlier and had reported the deal to authorities. Danielle Skiver had reportedly been given up for adoption by Bigbee almost 30 years ago and had not seen her biological mother all that time but had recently connected with her on Facebook, according to CBS affiliate WFOR. WFOR reports that during one of their conversations, Skiver mentioned she wanted a baby and Bigbee offered up her grandson for sale. Skiver then alerted authorities, an FDLE spokesperson said. Works and the child's mother, 22-year-old Stephanie Bigbee-Davis, both pleaded no contest for their parts in the scheme in March. Authorities said Bigbee-Davis knew about her mother's attempt to sell her infant son, and wanted some of the money to pay for a new car. Works was sentenced to time-served, and Bigvee-Davis received two years. But this story may have a happy ending; the daughter Bigbee gave up for adoption now says she wants to adopt Aidan legally.